Inspiring middle school aged students, though difficult, is achievable. This age group can certainly present a multitude of parenting and teaching woes. Students are emotional, hormonal, and full of ample insecurities. As students, some parents and teachers will find that middle school students find that school work is dull, uninspiring, and frankly boring. As such, their lack of desire to stay engaged in their studies can present a problem. If your student is preparing to apply for an elite high school, this may cause some difficulties. Middle School tutoring could help in this case. Additionally, a bit of coaxing at home with or without a tutor and at school, middle school students can make it through those problem years. 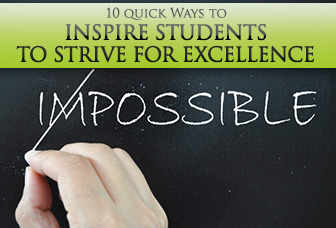 Here are ten ways to inspire your middle school student. Middle school students need to feel valued. They are at an age where they become self sufficient, however; they still have not acquired too many responsibilities. Adding small responsibilities to their weekly routines can help them to feel valued in the family. Whether that be a sole responsibility for pet feedings, raking the lawn or shoveling a sidewalk, middle school students need to feel like they have value in their surroundings. Each child is different, so consider what would make them feel like they matter. At school, getting your child involved in various after school activities can help with finding a place and purpose. Not every parent wants to admit that their child is addicted to video games, computers or texting, but let’s face it, technology is a big part of their development into adolescence these days. How do you appeal to this? To begin, we suggest paying attention. Then, add some structure or purpose to those interests. Take your child and a friend to a local gaming exhibition. Send your student to a local coding academy. Students can learn how to code games and apps as an extracurricular activity. Pay attention to trends in social media and technology. Remember that shielding them from social media and technology doesn’t necessarily help. Part of developing their identity these days is through technology. Be sure to openly communicate limitations. Caution your child of the dangers and encourage healthy communication with their friends. Oftentimes students in this age group do not understand the permanence of the internet or the potential damaging effects in the long run. Open communication about these facets of technology should be an integral part of their experiences online and with social gaming, networking and communication. They might not be little kids bringing home finger paintings of cows anymore, but they still want to know that their work matters. Hang good grades, sketches or photos of their soccer game up on the refrigerator. Issue awards for accomplishments and good behavior. Though they might not admit it, a funny trophy or ribbon might just result in that ever elusive middle schooler smile. It is common for students to think that the only time they need to read is for a school assignment or project. As a result, all books are seen as a dreaded responsibility. When a young student asks about something they don’t know, take that opportunity to go research the topic together. If you find your student is asking a lot of questions about the weather, bugs, or fantasy characters, then that is a sign that they thirst for information. Fostering that curiosity can go along way. Once again, pay attention and look for ways to help your student explore. This is a great age to show kids how they can have an impact in their community. While they might not enjoy serving food at a soup kitchen, they might enjoy getting involved in a community garden, toy drive or some other project where they can physically see the impact of their work. It is just a matter of finding the activity that best shows your student the imact of society they can have. Several organizations work with students and adults of all ages. Habitat for Humanity, Chicago Cares, various local charities, and community groups have ongoing projects to get involved with. Creating opportunities for middle school students to make decisions is key to their cognitive development. Encourage decision making in situations as trivial as what to eat for dinner to what kind of clothing they want to wear. Remember, it is okay to let students make mistakes with their choice making once in awhile. If they don’t make mistakes, they will never learn the value of their choices. Getting students involved in planning, decorating their room or even choosing weekend family activities will help them to assert themselves in the long run. Well, you might not like the sound of the music that they are blaring from their stereo each night, or you might not like their proclivity for bold nail polish colors, but that doesn’t mean you should stop them from experimenting. Middle school is a time where students are beginning to explore their interests. Much of the time, those interests are fleeting. Pay attention and give them room to explore their interests. If those interests involve learning, be sure to help them find the resources and activities where they can explore those interests even more. Additonally, a private tutor could be a great way to enrich their interests. Even if they don’t want to participate in a team sport, that does not mean that they shouldn’t stay active. Bike riding, skate boarding, swimming and dancing can easily be integrated into the average school week. Encourage movement and encourage exploration of different activities. Try out indoor rock climbing, go for a hike or even have them running around doing household activities. Keeping them active will not only keep them healthy, but it will help to keep their minds active. All too often parents and teachers concentrate on what a student is doing wrong rather than what they are doing right. Celebrate your student! Acknowledge when your student does something good. You might not get them to master every basic good mannered gesture at this age, but you can certainly celebrate the ones they are mastering. Good grades and helping the family can be even more meaningful with positive rewards. That might be extra time doing an activity that they enjoy, or a night with their favorite meal and dessert. Students need to see that not all adults are as dull and boring as they see their parents as being. As adults, we are quite aware that there are more jobs to be had then just teachers, doctors, lawyers and auto mechanics. There are so many cool and inspiring professions out there, and introducing those to a kid can have a lasting impact. Consider letting your child shadow a friend or coworker for an afternoon. We all have extensive networks of professional friends. Even if we don’t, many companies encourage this sort of activity for students of all ages. Have a student that likes building things? Perhaps they could shadow a designer at an architecture firm. Have a student that loves drawing? Have your student shadow a graphic designer or gallery director. Showing them the multitude of jobs can help direct their interests and keep them focused on making good grades in school. So, there you have it – 10 ways to inspire your middle school student. It may be a struggle, but just because they aren’t as bubbly as a five year old or as driven as an 18 year old does not mean they do not have something to add to their surroundings. Keep them involved, valued and interested. It might take a few tries to break through the seemingly insurmountable hormonal and emotional wall of a middle school student, but the path is there somewhere. In the end, they will thank you.